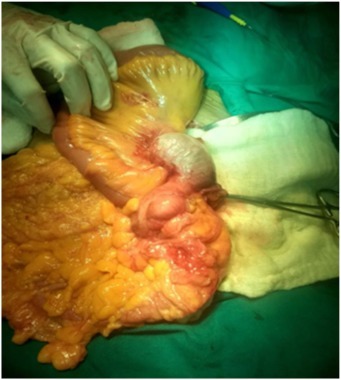 A 70 year old female came to Out Patient Department of Department of Surgical Gastroenterology, with 1 months history of vague pain abdomen, more localized to right lower abdomen, associated with generalized weakness, nausea and decreased appetite from last 6 months, no history of surgeries in the past. Patient reported mild right iliac fossa tenderness on palpation. She was afebrile. Laboratory investigations showed Leukocytosis with neutrophilia. Abdominal Ultrasonography showed encapsulated cystic lesion in the lower quadrant of the abdomen with a liquid content of variable echogenicity -? Appendicular Abscess /Mucocele Appendix. 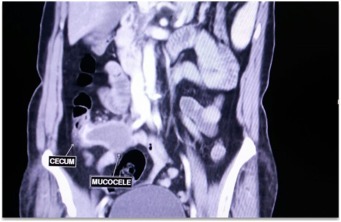 Abdominal CECT was done which showed Well circumscribed low attenuating tubular mass contiguous with the base of the caecum showing thin curvy linear mural calcifications with few low attenuating areas along the surface of the lesion f/s/o Mucocele of Appendix. Vertical Midline Incision Laparotomy was performed. 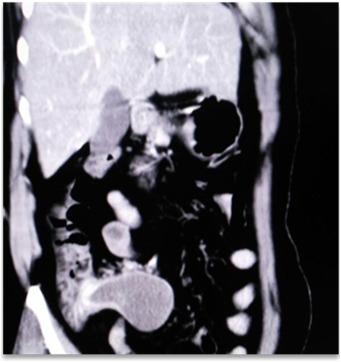 Intraoperatively a cystic mass of appendix with dimensions 8 cm × 5 cm with broad base and inflamed walls communicating with caecum but without perforation was discovered in right iliac fossa. Multiple significant lymph nodes of mesoappendix and ileocolic region were also found. With suspicion of malignancy and non-availability of frozen section, Extended right hemicolectomy with ileotransverse anastomosis was done. 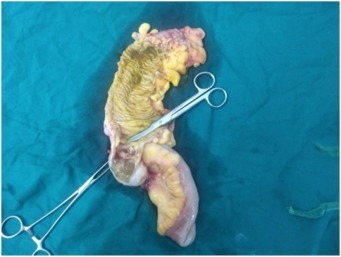 Histopathological diagnosis of Mucinous Cystadenoma with Mucocele was reported. After 6 months of surgery patient is doing well with no postoperative complications.